The United Nation has no scheduled meetings or agenda items between Sept. 23 – Oct. 10. Parliament in the United Kingdom is in recess from Sept. 15 – Oct. 10. And the U.S. Congress, after “coincidentally” being in recess during the nuking of two underground civilizations for the Ruling Cabal (which they called “earthquakes” in Washington, DC and Denver) in late August, is also in recess (again) from Sept. 26 – Oct. 2. German President Christian Wulff also has an empty schedule after Sept. 25. “Coincidentally,” there are also several conferences being held for large corporations and government agencies in Denver between Sept. 26 – 28. These include, among others, a Homeland Security Symposium and a Coca Cola Company Symposium. Meanwhile, two category 6.0+ earthquakes struck off the east coast of Honshu, Japan this past Friday within hours of one another, and got almost zero media coverage. Around 7 a.m. Arizona time yesterday, a magnitude 6.9 quake struck Sikkim, India. And it would be disingenuous not to mention that Palestine will get non-member statehood from the UN General Assembly right before said assembly goes into recess, which of course will cause the U.S. government and Israel to go into a hyper-hissy fit, and we’ll likely see yet another phony terror attack on American soil to scare the sheeple into hating Muslims even more and as a phony cause for wartime conditions. Get your boots ready folks! Learn how to construct a solar still; learn how to shoot a slingshot; etc. The writing is on the wall in my opinion. Again, we’ll keep updating until…..
As expected, a 7.0+ quake did strike within the Ring of Fire, but it was not in California (yet). The 7.3 quake in Fiji – about 2800 miles (4500 kilometers) east of Australia, happened around 12:30 p.m. Arizona time. Of course, state-run “mainstream” media have not said a peep about it. Though a 5.1 quake struck the South Sandwick Islands, the cluster of of island on the southern tip of South America, nobody (especially me) really cares because no real people are from there, nor live there…just British imperial scientists and military personnel. I found some excellent pictures from the CME (Coronal Mass Ejection) that happened on September 9, which is the cause of the blackouts occurred in Arizona, California, and parts of northern Mexico on that same day. Reported by “America’s most trusted network,” a magnitude 6.0 quake hit between Cuba and Jamaica; 45 minutes earlier, a Magnitude 6.0 hit off the coast of Japan; and 7 minutes before that one, a 6.0 quake hit New Zealand. Here we go people! I’ve been trying really hard for the past few days to convince myself that “Comet” Elenin is nothing to worry about, but today’s update has placed the proverbial writing on the wall. General Alexey Maslov, of Russia, released a report stating that the U.S. government informed him of an upcoming DEFCON1 maximum readiness alert drill on September 27, which President Obama will “oversee” at the government bunker located beneath the Denver International Airport (scroll down for the Jesse Ventura report on this bunker). Of course, September 26-28 is when “Comet” Elenin will be aligned in a linear configuration with the Sun and Earth; each time of which, a major earthquake happened (scroll down for more info). Denver also happens to be the headquarters of the domestic division of the CIA (isn’t that an oxymoron? ).This alignment, of course, is different from the others, since Elenin will be closer to Earth than it had been in any of the previous ones…thus nobody really knows what may happen (again, scroll down for more). Meanwhile, a category 4.2 earthquake struck Southern California yesterday. If this was the 188 day cycle earthquake (see below…again), than it can be considered a “dud.” But as of publishing of this update (0136 Arizona Time), there are still 23 hours left in the day. Media coverage, especially by state-run giants CNN, Fox News, and MSNBC, was virtually non-existent. 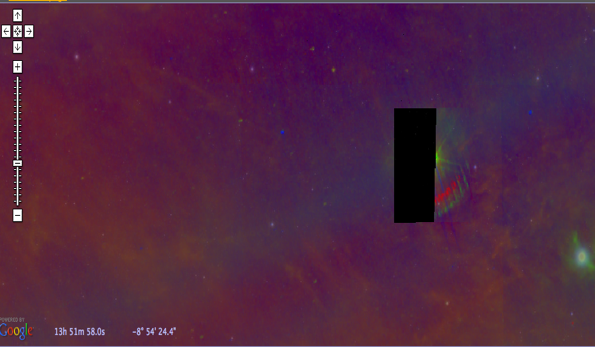 The last coordinates I obtained for the position (about 12 hours ago) of “Comet” Elenin in the sky were 13h 57m 4.0s -8degrees 51′ 48.1.” Here is an image from Google Sky around those coordinates (and with infrared activated). This just seems really bush league and juvenile for Google to do, but I guess when they and all other state-run media naturally want to control what we can and cannot see, read, watch and/or listen to, they’ll do so. Meanwhile, as two major dates approach (see below), there is a buzz online that HAARP (High Frequency Active Auroral Research Program) – which is a U.S. military war weapon capable of engineering fierce tornados, hurricanes, earthquakes, and other weather phenomena – may simply make some of these things happen in the near future. This would not be a first for HAARP, and I suggest those who know nothing about it do their own research, but here is a good start. If the clockwise parralelogram pattern, along with the 188 day pattern continue, northern California will get hit on Thursday, September 15. But the number 188 have significance for Christians as well. The book of Revelations in the Holy Bible has 404 total verses. Revelations 11:13 is,coincidentally or otherwise, the 188th verse of Revelations, and reads: In that day there was a great earthquake, and a tenth of the city fell. Seven thousand people were killed in the earthquake, and the rest were terrified, and gave glory to the God of heaven. Magnitude 5.1 Earthquake hits Auckland Islands area of New Zealand. Again, no news coverage. Magnitude 4.3 Earthquake Hits Germany and Netherlands. Not much news coverage of it. Magnitude 6.7 Earthquake Hits Vancouver, Canada. Meanwhile, several reports indicate that the Sun’s gravitational pull may have slowed Elenin down, which may push perihelion (see below) to September 14 instead of September 11. This article must be prefaced with the fact that I am not a scientist, nor do I claim to be an expert in astrophysics or astromomy. One thing I do boast, however, is common sense, which is all anyone reading this will need to draw their own conclusions on the inevitable upcoming events we as a species have to face. There were four major occurrences yesterday state-run U.S. media made the stories du jour: the first game of the NFL season, President Barack Obama’s job’s speech, blackouts in Arizona, California, and Mexico; and of course the “terror threat” they created and are disseminating. Football and the Ruling Class’s political minstrel show captivated most of the country, except of course those who had (and still have) no electricity in California and Arizona. 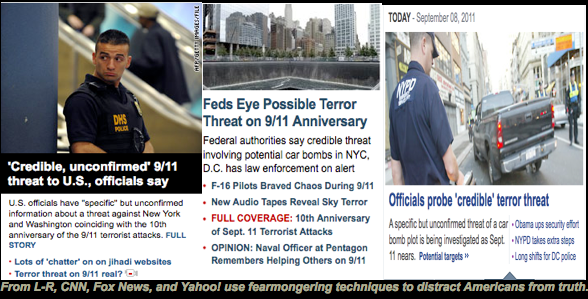 Several U.S. media outlets inserted the words “terrorism” or “terror threat” whether in print or on television when referring to said blackouts. Once this seed was planted, state-run media executed its agenda (Islamophobia and fearmongering) and told Americans a “terrorist attack” is likely to happen this coming Sunday. But pseudo-terrorism is the least of our problems to come. We’ll get back to the blackouts shortly. Most of you (because state-run media are clever) have probably never heard of Elenin. 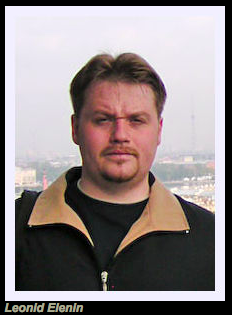 It was December 10, 2010 when Russian optician and amateur astronomer Leonid Elenin discovered a celestial object about 4 astronomical units (one AU = about 93 million miles or 150 million kilometers) away from Earth, which became known as C/2010 X1, or Comet Elenin. Though there is no actual evidence of this, speculation persists that Mr. Elenin does not really exist and was created out of thin air by the global Ruling Class. It is, however, unusual, quite intriguing, and crazy coincidental that in the 1998 movie “Deep Impact,” not only is the discoverer of the fictional movie comet named “Leo,” but the U.S. government referred to the comet as an ELE (extinction level event) in the movie (along with several other crazy similarities…even down to predicting the “BLACK” president). 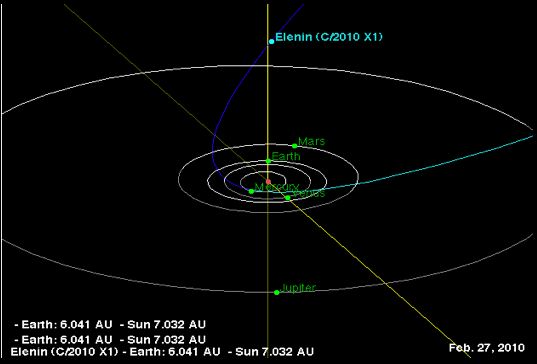 As of publishing, Elenin is now only .754 AU from Earth, or about 270 million miles closer than it was when initially discovered 10 months ago (though I’m fairly positive the Ruling Class has known about Elenin for much longer than that). Elenin and its orbit have been hot topics of discussion for those seeking truth and for those who study the Mayan calendar and other 2012 prophecies. In order to understand Elenin and the impact it WILL have on Earth and humanity, let’s first look at the Mayan Pyramid of Consciousness and get a general understanding of it. This diagram may look daunting at first, but is actually quite simple to read. 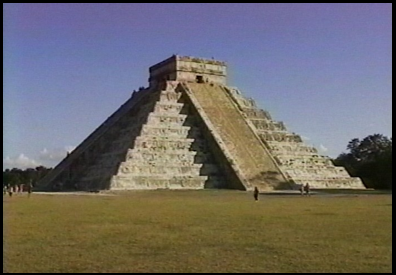 This diagram represents what real life Mayan pyramids look like, such as this one known as Chichen Itza, located in the Yucatan Peninsula in modern day Mexico. The nine steps on this 5000+ year old structure each represent a level of human consciousness. For instance the Cellular Cycle (the first/bottom level) took humanity (or our cellular structure) 16.4 billion years from start (Big Bang) to finish (fruition) to master said level of consciousness. 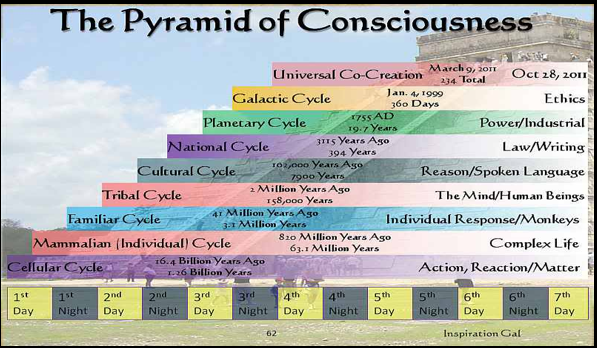 Each stage is divided into 13 equal, alternating dark and light stages which all mark a subtle change in human consciousness. In other words, every 1.2 billion years (16.4 billion divided by 13), cells which would become humans became more conscious and aware. As we move up the pyramid, each stage speeds up by 20 times. As you can see, in our current (and last) stage of consciousness (the Universal Co-Creation Stage), there are only 234 days in it; divided by 13 and human consciousness is, in 2011, now evolving every 18 days, until the end of the calendar on October 28, 2011…well before all the better known December 21, 2012 “end of the world” theories. If you want more information on the Pyramid of Consciousness, please watch this video (which I highly recommend). Now back to “comet” Elenin and the blackouts. Yesterday at 15:46 Universal Time (7:46 a.m. Pacific), sunspot 1283 (as NASA calls it) unleashed an M6-class solar flare and accompanying CME (Coronal Mass Ejection). Solar flares are classified as A (weakest), B, C, M, or X (strongest) and from levels 1-9. The CME, which was unleashed in the direction of Earth yesterday, caused a geomagnetic storm (disturbance in the Earth’s magnetosphere) which have a history of knocking out power. On March 13, 1989, a geomagnetic storm caused by a CME resulted in a nine-hour blackout in most of Montreal, Quebec and several power companies in the United States experienced minor disruptions that day as well. Ok, I know this is getting a little “sciency,” but follow along. 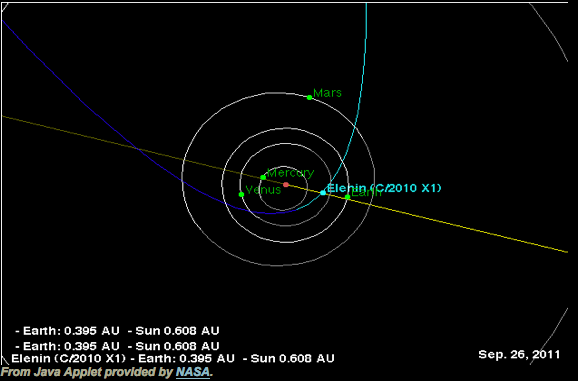 The perihelion of Elenin (when it reaches its nearest point to the sun) is, surprise, on September 11, 2011. In the last four days, sunspot 1283 has been so active that scientists have begun calling it “old faithful,” after the geyser in Yellowstone Park which spouts off reliably round the clock. The CMEs will continue and get stronger until the perihelion…thus power outages and other processes effected by electrical current will continue for at least the next week, peaking in intensity on 9/11. The official explanation regarding the blackout in California/Arizona/Mexico is the outage was “likely caused by an employee removing a piece of monitoring equipment that was causing problems at a power substation in southwest Arizona.” This apparently is the best the Ruling Class could come up with, in order to preserve their “terrorism” desires for the next outage or other disruption, which will inevitably happen between now and 9/11. The 12th of the 13 equal dark and light stages of our current level of consciousness begins on September 23, 2011 (the final dark stage). 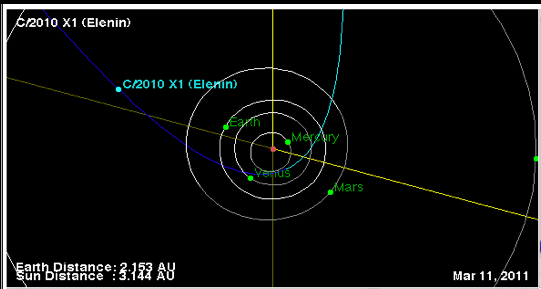 On September 26, 2011*, not only will Elenin be directly between the Sun and Earth for the first time ever, but Mercury, the Sun, Earth, and Elenin will all be perfectly aligned in a straight line. Note: the Sun is the red dot in the middle. So why is this alignment significant? First of all, from a biblical standpoint, Elenin and its tail (trail) will obstruct light from the Sun to the Earth for at least THREE DAYS (similar to an eclipse). Catholics and some other Christians believe that God will punish the world for its idolatry with three days of darkness, which will precede the end of time. Anyone who leaves their home during this darkness will die on the spot, according to the apocalyptic tradition. 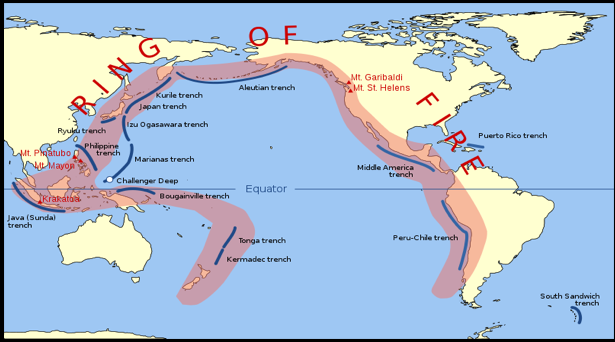 But secondly, and more empirical, whenever Elenin, the Sun, and Earth have aligned, massive earthquakes have happened. On February 27, 2010, said alignment also happened. On this same day, Chile was rocked by an 8.8 magnitude earthquake. The next alignment happened on September 4, 2010. On this same day, a 7.0 magnitude earthquake struck Christchurch, New Zealand. dar (see above). Coincidentally or otherwise, March 11 would see another alignment and guess what…. I think we all remember Japan and the 9.0 magnitude earthquake pretty well. 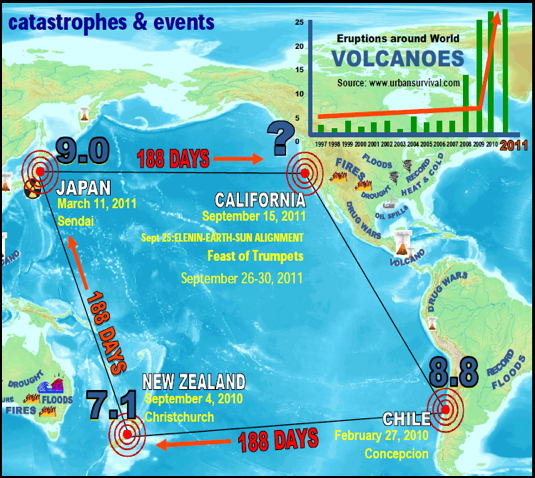 Interestingly, the New Zealand earthquake happened exactly 188 days after Chile; and the Japan earthquake exactly 188 days after New Zealand. I will let the image below speak for itself. If the clockwise and 188-day patterns stay true, it appears California is next. The only item which may weaken the argument for an earthquake in California on September 15 is that the next alignment will not happen until September 26. The madness does not end there. 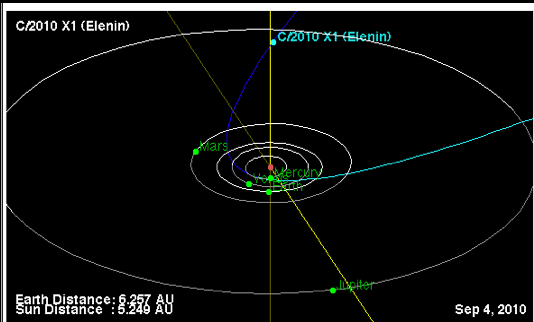 Elenin will reach its “Earth perihelion” (closest point to Earth) on October 16, 2011, when it will be only .234 AU away (about 21,800,000 miles or about 35 million kilometers)…or about 14 million miles closer than Mars ever gets to Earth. The truth is, nobody really even knows what Elenin is. It is called a “comet” but some believe it may be a brown dwarf star. Others believe it is a 10th planet called Nibiru which is said to come into our solar system every 3600 years. If Elenin is simply a small comet a few miles in diameter, it should not effect Earth too much when it reaches its closest distance. But if it is anything bigger (which we’ll all know very soon), the gravitational pull could cause disturbances unknown to all of us. It is convenient for the U.S. government (Ruling Class) to invoke the “terrorism” card in a time which it seems inevitable that humanity will experience dramatic change in the next seven weeks. Hypothetically, if power outages, floods, earthquakes, and darkness all happen simultaneously and repeatedly over the next few weeks, it will be the first time a vast majority of Americans will have to check their materialism at the door. When the day comes that you cannot flip a switch for light, turn on a faucet for water, or go to the supermarket for food, it will finally force humanity to re-connect with Earth and one another; find a deeper purpose besides a house, car, and job; and love one another in the face of real global crisis. Those who are too fearful to do so will become the slaves of the Ruling Class who will promise them food, jobs, and shelter if they submit to them. As I wrote about last week, it is common knowledge that the Ruling Class already have underground bunkers which they will retreat too in the face of societal unrest; and re-emerge as “saviors” to the rest of us. Former Minnesota governor Jesse Ventura also covered this phenomenon. Rest assured there is no “Muslim terror threat” at all, contrary to the fearmongering tactics the U.S. government is using. The Ruling Class hates Muslim and wants to wipe them all out, thus will use these upcoming events to their evil advantage. Americans are still 80 percent sheep and will believe anything this state-run media tell them. I’m not attempting to predict the future, nor am I even necessarily stating any of the above will actually occur. I am, however, presenting facts and evidence to allow you to draw your own conclusions. Whether you want to accept it or not, a shift in humanity is occuring as we speak and it will change our lives. The fact this government is lying and still playing childish hatemonger politics at a time they should be addressing the issues above, should be all the skeptics need to realize we must trust and love one another. We’ve seen repeatedly what happens when we trust the Ruling Class. Do whatever you feel is necessary with this information. I will likely not be blogging for a while for various reasons (including some contained herein). The question we all must ask ourselves is “what defines me?” If the answer is a car, a house, and/or a $100,000/yr job, you likely will not make it through the upcoming seven weeks. *all dates regarding upcoming events in this article have an error margin of +/- 36-48 hours, due to changing speeds of Elenin as it encounters the gravitational pull of the Sun. Did you know the suspicion around the speech president Obama gave on 9/11??? He recites Psalms 46 which talks about the end of the world through cataclysmic events! When he said that it brought to my mind the scene from the movie “2012” when a ‘black’ president says his last farewell speech to the world before it gets destroyed. In the end of his speech he recites psalms 23 “The Lord is my Shepard I shall not want”…. What is 23 times 2??? 46! Coincidence??? The number 23 is a symbolic representation for judgment in the bible. Two 23’s means an emphatic statement or double judgment! Creepy!